Nathan J. Fink focuses his practice on commercial and class action litigation, including business matters, antitrust, securities fraud and intergovernmental disputes. He has quickly earned a reputation as a creative, tenacious advocate, obtaining successful results for his clients. He has handled cases from the pre-suit stage through jury trial. He has litigated cases in numerous state and federal courts, including multidistrict class action litigation. Nate was honored as a Rising Star in Michigan Super Lawyers magazine in 2013, 2014, 2015, 2016, 2017 and 2018. Nate was recognized as one of DBusiness Magazine’s 2017 Top Lawyers and 2018 Top Lawyers. 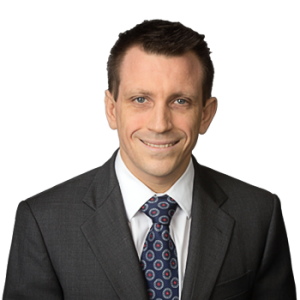 In 2017, Nate was selected by Michigan Lawyers Weekly as an Up and Coming Lawyer. Prior to joining Fink Bressack, Nate honed his litigation skills at a large Detroit-area law firm, obtaining successful outcomes for his clients. Nate also spent time working for the Wayne County Prosecutor’s Office, where he tried multiple bench and jury trials to verdict. Since joining Fink Bressack in 2015, Nate has worked closely with the firm’s public and private sector clients on complex pre-litigation and litigation matters. Nate has taken the lead in litigating a multimillion dollar arbitration involving an extraordinarily complex failed business partnership. Nate is admitted to practice in the State of Michigan, including both federal courts in the State. Nate is a member of the Oakland County Bar Association, Federal Bar Association and the Detroit Bar Association. He was elected President of the Michigan Lawyers’ Chapter of the American Constitution Society (ACS). Nate earned his Bachelor of Arts degree from the University of Michigan, where he served as Vice President of the Michigan Student Assembly. He earned his juris doctor degree from Wayne State University Law School. While in law school, Nate interned for Judge Mark Goldsmith. Nate was Associate Editor of the Wayne Law Review. Nate was born, raised and educated in Michigan. In his (limited) free time, Nate enjoys running, skiing (water and snow), and rooting on his beloved Michigan Wolverines. Nate resides in West Bloomfield with his wife and four children, who also happen to be four of David Fink’s favorite grandchildren.